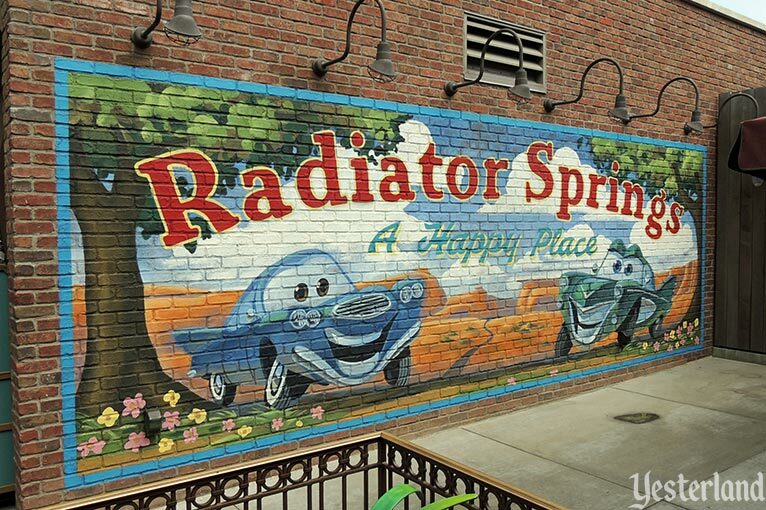 While watching the Disney-Pixar feature Cars in a movie theater in 2006, I found myself wishing I could step into the town of Radiator Springs. In 2012, that became possible on both sides of the United States. Yesterland usually looks at things that are gone, but not today. 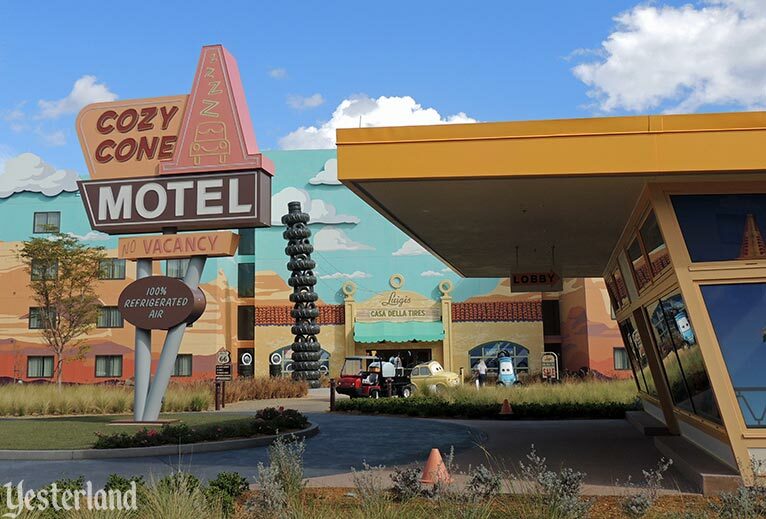 This photo essay looks at how some of the same landmarks of Radiator Springs are represented at the delightful Cars wing of Disney’s Art of Animation Resort and in the highly detailed Cars Land at Disney California Adventure. The Imagineers’ approaches were completely different—but in both cases, the results are wonderful. 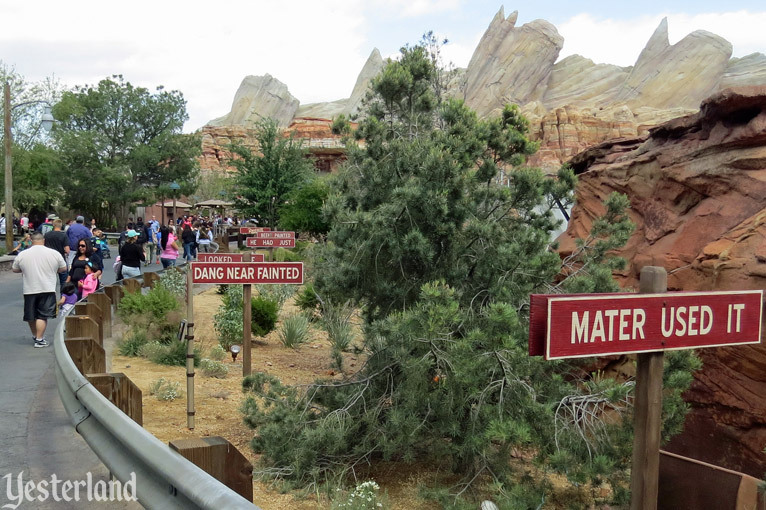 Disney’s two interpretations of Radiator Springs each serve a different purpose. 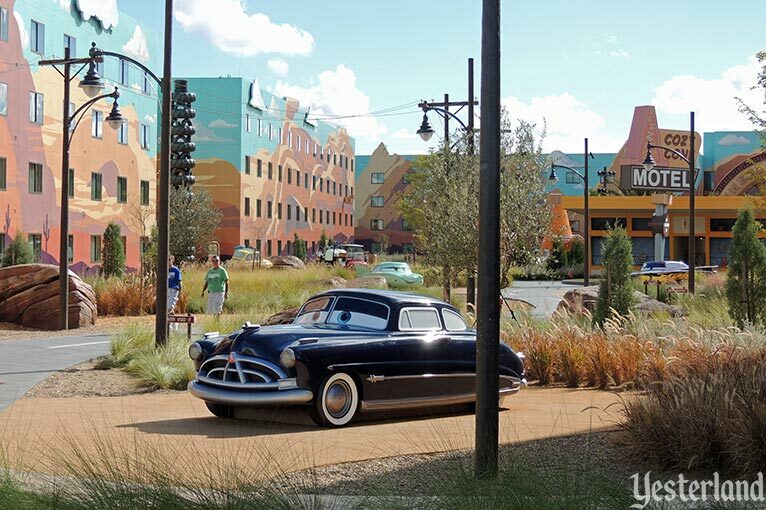 At Disney’s Art of Animation Resort in Florida, landmarks from the town, its desert valley environment, and main characters from Cars serve as decorations for three hotel buildings and the courtyard between them. 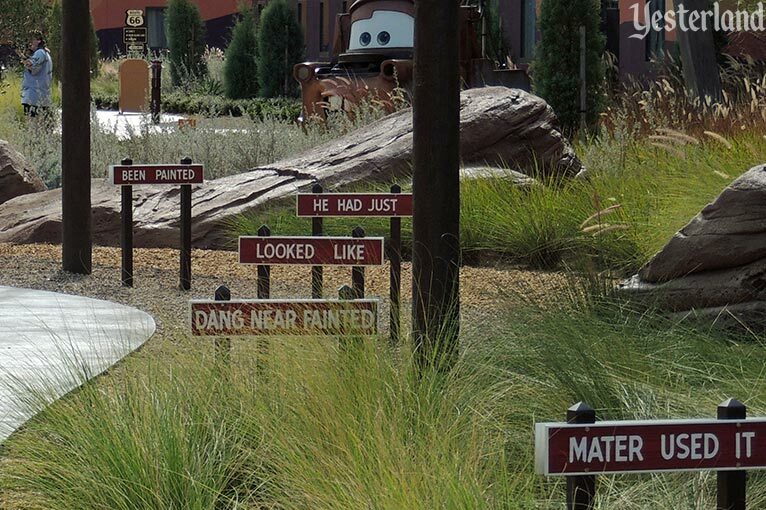 The Cadillac Range and other mountains from the movie are painted on the building walls. 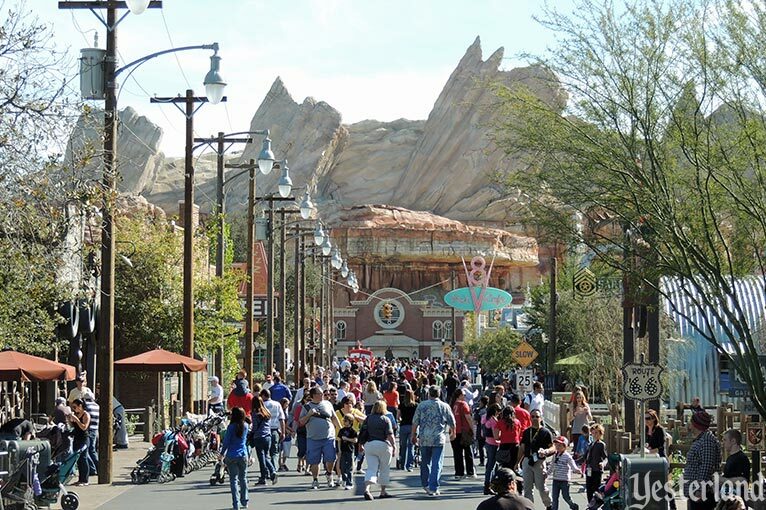 Cars Land in California is one of the most immersive theme park lands ever built. It’s home to attractions, restaurants, and shops—and a streetscape that’s so engaging that guests enjoy standing around taking it all in. The mountains look real, especially at night when it’s harder to judge size and distance. 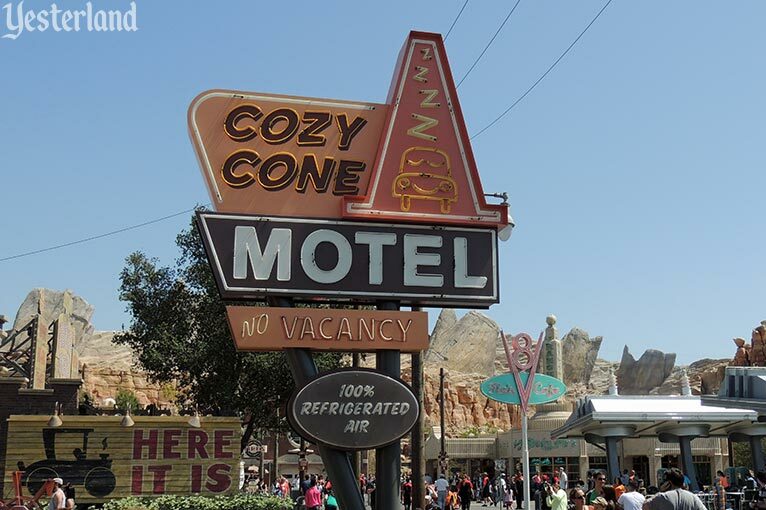 A few landmarks, including the freestanding sign for the Cozy Cone Motel, are very similar at both locations. That’s not surprising, considering that the digital images from the movie could provide an exact model. 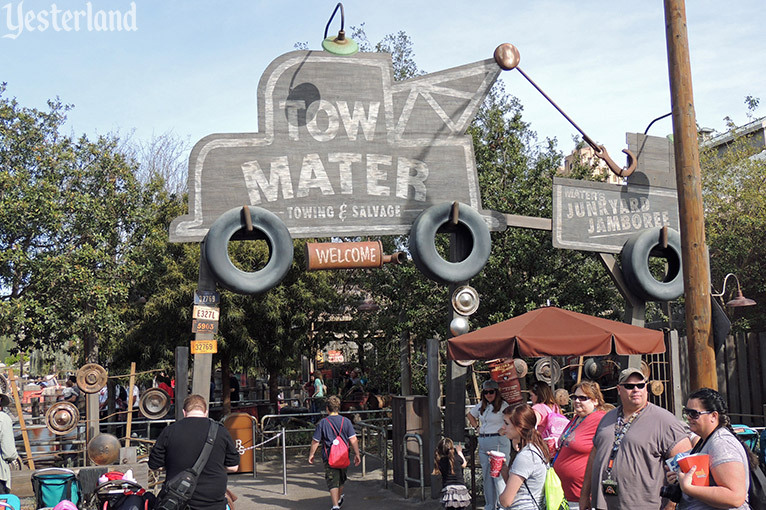 In a way, it’s more surprising that there was not more cloning between the resort and theme park versions. 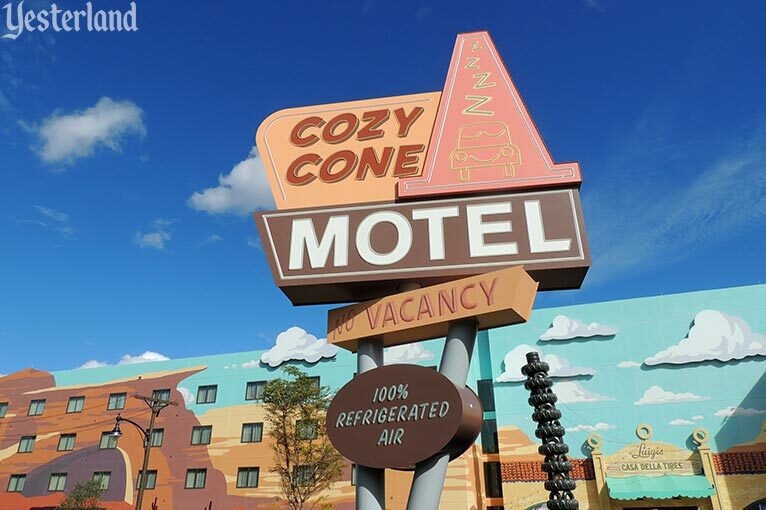 In Florida, the front of the Cozy Cone Motel is an entrance to the Cozy Cone Pool. Around the semi-circular pool, eight large orange cones serve as cabanas. 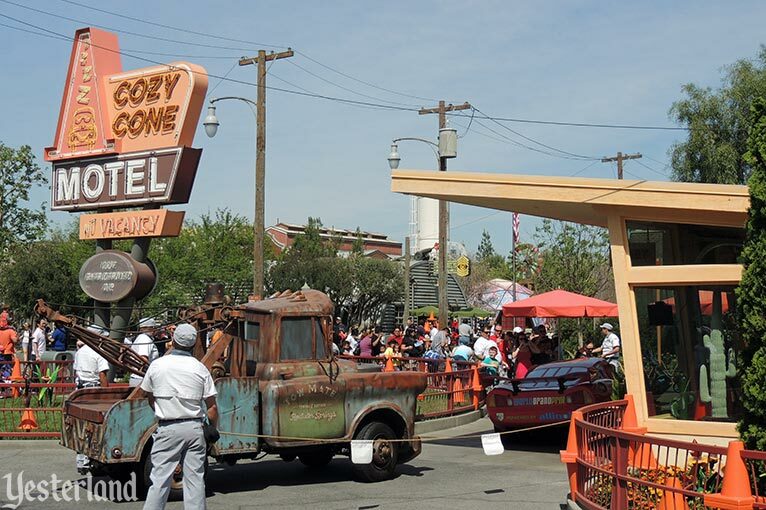 In California, the front of the Cozy Cone Motel is a meet-and-greet. In the back, five large orange cones serve as an imaginative food court. Both locations rely heavily on billboards and signs to establish a sense of place and time. Sometimes the graphics are similar. At first glance, the gas pumps for Butte Gas look similar at both locations. But notice that the pumps in Florida have rolling numbers to show the quantity pumped and to calculate the price, while the pumps in California use the older system of a scale dial on each pump. 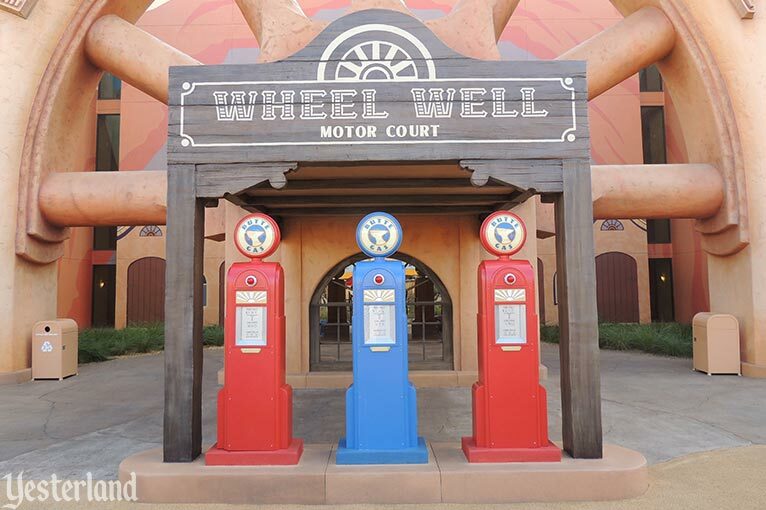 The Wheel Well Motor Court from Cars is prominently featured in Florida, but is missing as a landmark in California. At both locations, consecutive roadside signs advertise Rust-eze in the tradition of Burma-Shave signs along American roads from 1925 to 1963. The signs in Florida and California are similar—but notice how different the roadsides are. 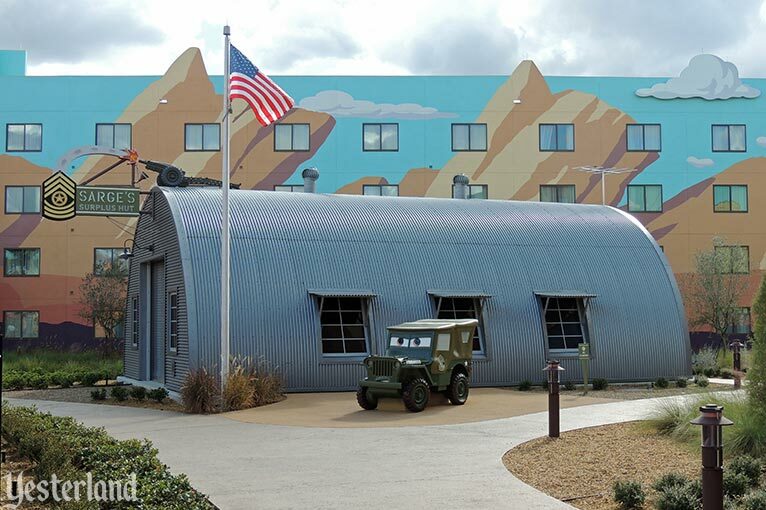 At Art of Animation, Sarge’s is not open to guests. The Quonset hut is a clever way of hiding equipment for the Cozy Cone swimming pool nearby. 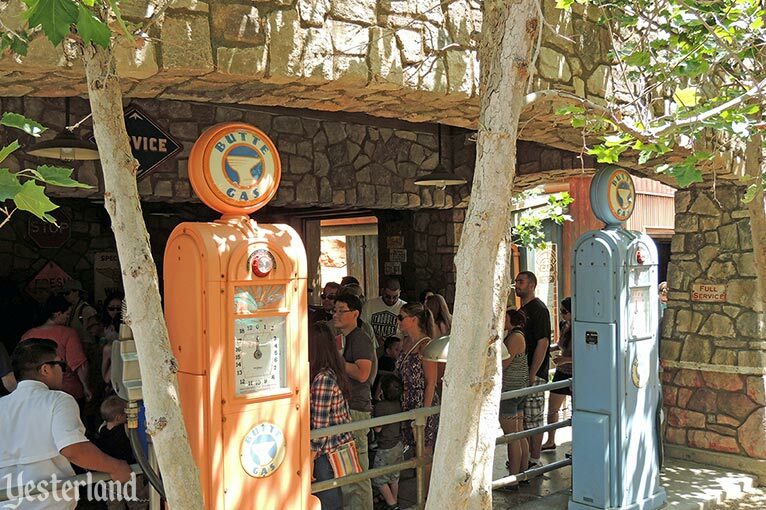 At Cars Land, Sarge’s is a large retail shop. 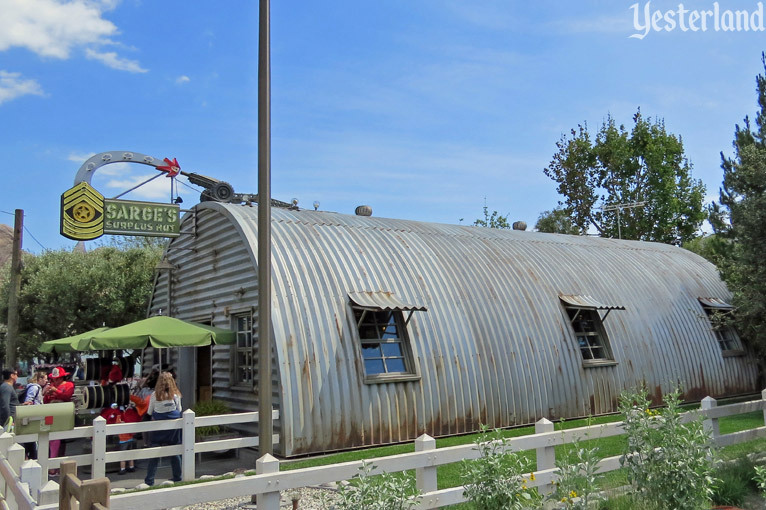 An additional wing gives the corrugated steel hut a “T” shape to hold more of the popular Cars-themed merchandise sold within it. Notice how the Florida version is a pristine new structure, while the California version has been given a weathered and worn appearance. 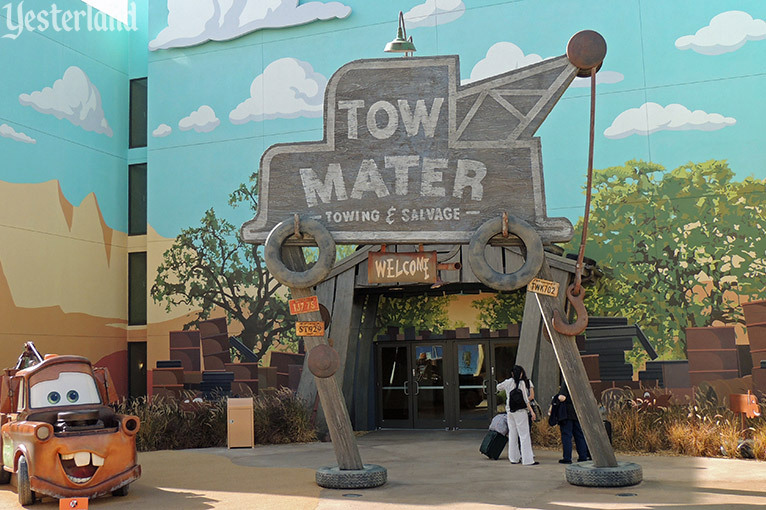 Toe Mater’s sign from Cars became a building entrance in Florida and a ride entrance in California. 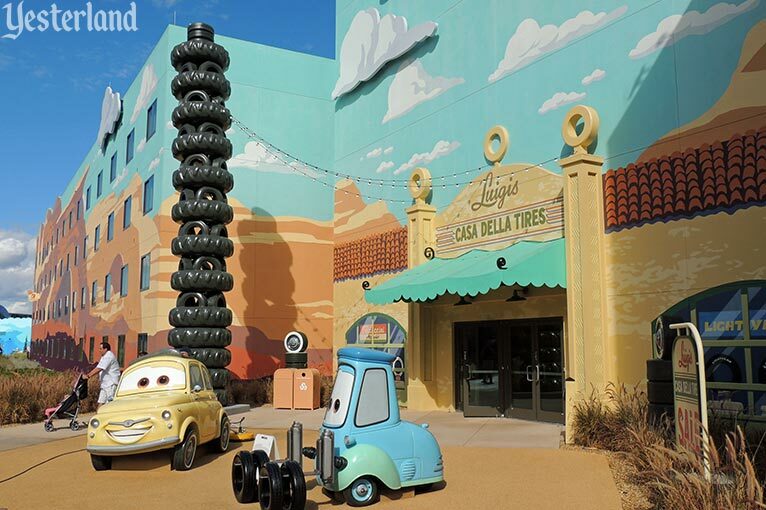 Although there are no rides at the Cars wing of Disney’s Art of Animation Resort, the full-size Cars characters are attractions in their own right. 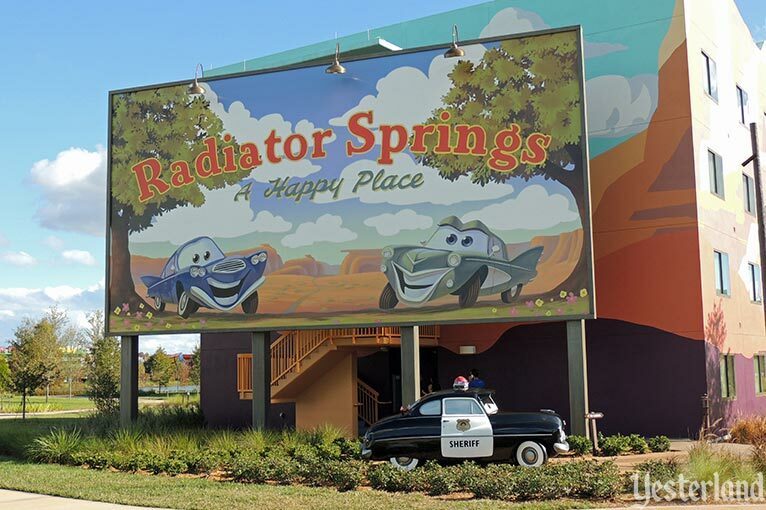 Guests pose for pictures with Sheriff, Doc Hudson, Luigi, Guido, Sally, Lightning McQueen, Ramone, Flo, Fillmore, Sarge, and Mater. 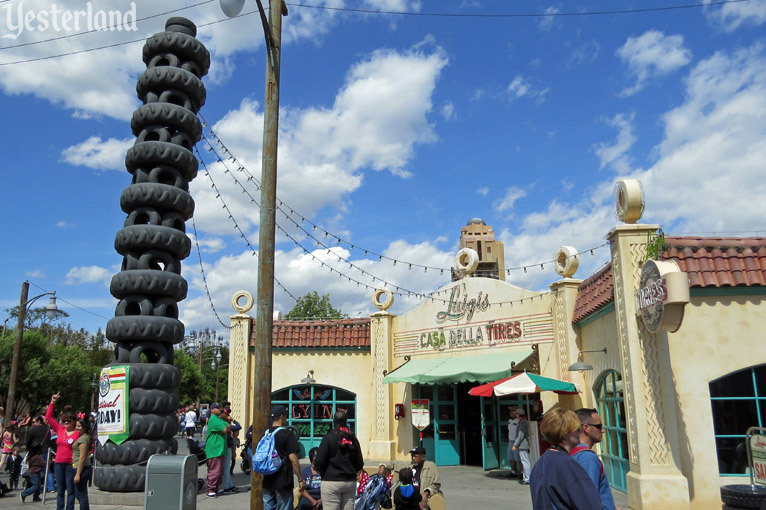 Luigi’s Casa Della Tires is arguably the best example of how the same Cars landmark was simplified into a striking decorative entrance in Florida and fully realized for authenticity in California. Each is terrific in its own way.